It usually takes some kind of achievement or trophy you can show off to your friends to compel people to 100% complete a video game. For Steve Tolin, however, all it took was the pursuit of true completion. That and 773 hours of his life. 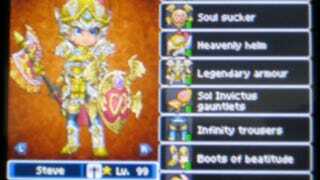 Tolin has completed 100% of Dragon Quest IX's content, the DS game wrung bone dry in pursuit of completed post-game challenges and items like the infinity trousers. In a neat touch, after completing quest 184, a congratulatory message from Dragon Quest creator Yuji Horii appears. You can read an interview with Tolin at Tiny Cartridge, linked below.